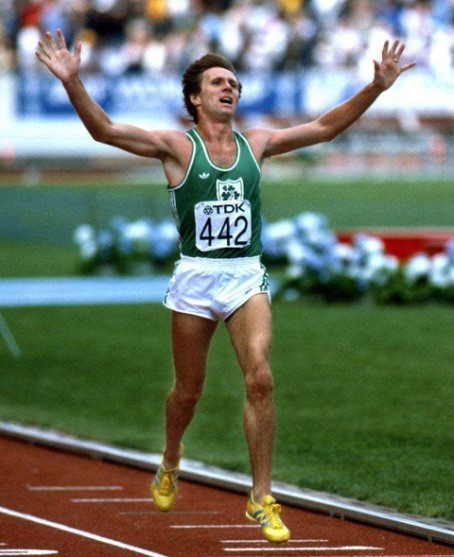 By any standards, Eamonn Coghlan’s 1983 was an exceptional year; first that sensational world indoor mile record of 3:49.78 for the man known universally as Chairman of the Boards, then later in the summer, the inaugural IAAF World Championship 5,000 metres title - a landmark achievement in Irish athletics. That victory in Helsinki was one of the greatest moments in Irish sport. Eamonn ran the perfect race, third at the bell, making his move 300m out, and by the time they hit the home straight it was all over - 13:28.53, and the last 1,000m at sub-four minute mile pace. Everyone remembers his jubilation at the win, and at 30 years of age it was no more than he deserved. He won three AAAs titles, 11 Irish Championships, the World Cup 5,000m in 1981 as well as seven Wannamaker Miles. There was a brilliant 4:54.07 world record for the 2,000 metres, and then that unforgettable swansong; the first – and to this day only – sub-four minute Masters Mile. Has any athlete ever made a more fitting exit from the arena? It could hardly be more appropriate that this Hall of Fame Award comes 25 years after Eamonn Coghlan’s finest hour that day in Helsinki. A well-deserved honour for a truly great athlete.